Don't get wrapped up in the stirred versus shaken debate. What you need to be concerned with is silver. Drink your martini in luxury with Tiffany & Co.'s. 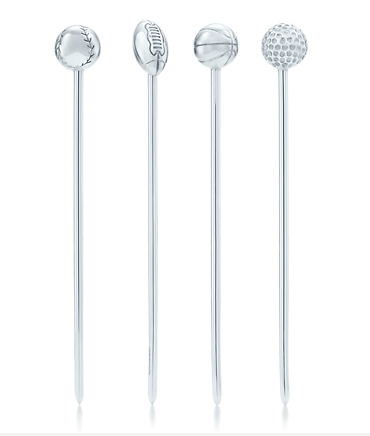 gorgeous set of silver sports-themed cocktail picks. 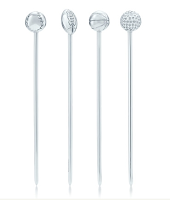 For $275 these 3.25" long garnish skewers will add additional value to that evening libation you've already deemed priceless, and appreciate the value of your make-shift home bar (AKA cupboard). Perfect for the dad, brother, grandpa who has everything and even more perfect for the man who has nothing. Get your holiday shopping on early and let the televised sporting events begin.